Thank You for choosing Gary Greene Vacation Rentals! Our goal is to make your vacation to Galveston Island as special and memorable as possible. We have many privately owned vacation homes and condos, in a wide variety of styles and sizes, available for weekly or weekend rental. All of our homes are located on the beach, on the bay, on a canal or within walking distance or a short drive of the beach. We can accommodate a family of four or a group as large as twenty! Whatever your heart desires, we are here to see that your vacation will be the best! Remember, all of our properties will come equipped with linens, towels, dishes, cooking utensils, pots & pans, coffee maker and a bbq charcoal grill. You are responsible for bringing your own beach towels, paper goods and toiletry items. If you have any questions do not hesitate to contact our office. We are open 7 days a week from 9am to 5pm. 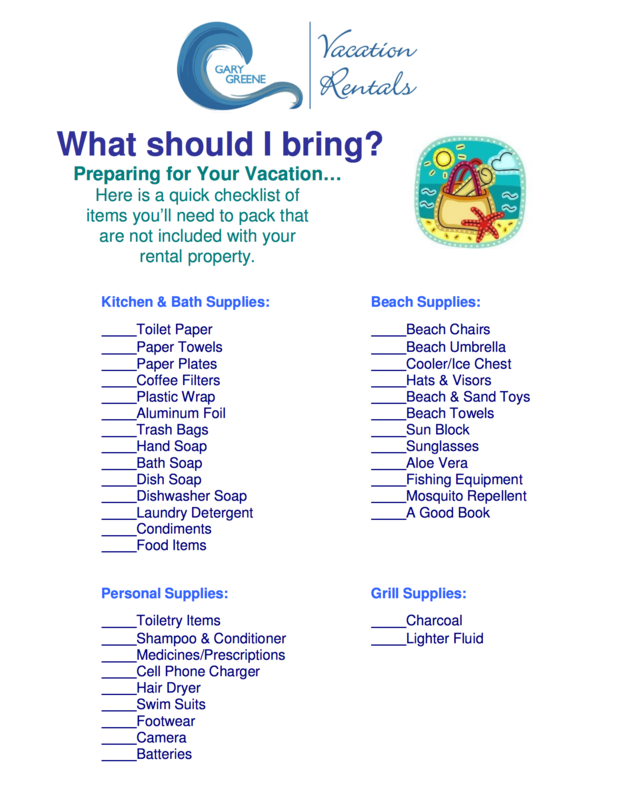 << Please check out our What to Bring packing check list for items that are not included with your rental.